Are you looking for an easy way to spruce up your seasonal selfies and add some pizzazz to the dreaded holiday-party group photo? Then grab some glue sticks and a willing helper (this craft is great for kids) and make a Goat-o-Bomb or two! Why a Goat-o-Bomb? If you follow our work you know that goats aren’t just photogenic – they play a key part in ending hunger and poverty for families around the world. You can spread the word about the life-changing power of livestock by sharing your best Goat-o-bomb pic this Giving Tuesday (and beyond) and telling your friends and family why you #GiveHeifer! Ta-da! Your very own goat-o-bomb mask! 2. 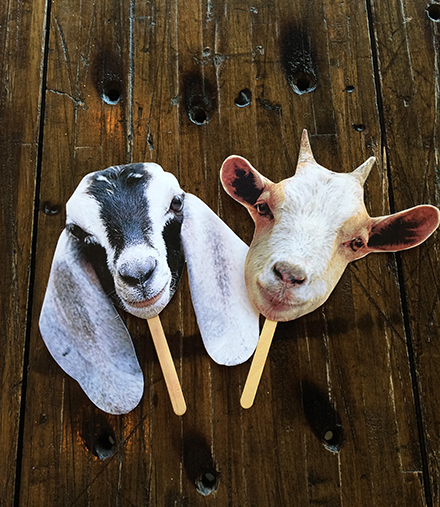 Print your goat onto a sheet of cardstock or another type of stiff paper. 3. Cut out the Goat-o-bomb carefully with scissors so that no blank paper remains. Once you have finished cutting, flip the goat so that the blank side is facing you. 4. Glue or tape the popsicle stick to the blank side of the image. Note: This is your Goat-o-bomb handle so make sure that at least ¾ of the stick is showing when you flip your goat right side up. 5. Celebrate your craftiness – take a selfie (or goat-o-bomb someone else's ???? ) using your freshly minted Goat-o-bomb! 6. Share your photo on Giving Tuesday (November 29th) and tell us why you #GiveHeifer during the holidays and beyond! Giving an animal through Heifer International is no ordinary gift. It’s like giving someone who is struggling with hunger and poverty a sustainable source of food and income. Browse our catalog to learn more about the impact of livestock and find the perfect donation to give in honor of everyone on your holiday gift list.